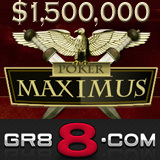 Daily events in the $1.5 million Poker Maximus Tournament begin Sunday at GR88.com. The poker tournament will feature 70 events over the next three weeks and will culminate with a $200,000 Guaranteed Main event 25th March. A total of $1,500,000 in prize money will be awarded. Starting on Sunday 4th of March, GR88.com will host at least three Poker Maximus events every day finishing on the 25th of March with the $200,000 Guaranteed Main event. This exclusive series offers players the chance to win entry through Poker Maximus satellite tournaments from as little as $0.55, while each event winner will have the chance to participate in the Poker Maximus Tournament of Champions. On the Merge Gaming poker network, GR88.com Poker offers Texas Hold'em, Omaha, Stud and Draw and has thousands of players online to play them with. There are cash games and tournaments running 24 hours a day, including a $100K Guaranteed tournament every Sunday. The Badbeat Jackpot is currently over $200,000. Using a single wallet, GR88.com players can also enjoy hundreds of casino games from Microgaming and CTXM or bet on thousands of sporting events including in-game betting.